What do Queen Esther and Spider-Man Have in Common? What do Queen Esther and Spider-Man have in common, you may be wondering (or maybe you aren’t wondering, but I am!). In this month when we celebrate the craziest Jewish holiday, Purim, it’s a good time to be thinking about superheroes and how they use their superpowers for good in the world. 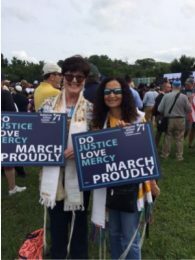 "I Am A Different jew today"
This was a banner week for Temple Beth Sholom’s Social Justice Network Advocacy. It started off on Sunday, Purim, when we collected 50 letters to Florida Senators Garcia and Flores protesting Senate Bill 140, which would permit open carry on campuses, schools and airports. We have now sent in over 150 letters.